As we begin another winter holiday season, many of us start to look for ideas to improve our annual decorating routine. While some homeowners have traditional items they display between November and January, often times we want to do something new and different instead of just the same old decorations and layout. One area that can always benefit from a fresh perspective and new ideas is the stairway of your home. Often one of the first areas visible in your home upon entering, the stairway offers numerous opportunities to create a festive display for everyone to enjoy. Here are some items and ideas for turning your indoor stair railings into one of the highlights of your holiday decorating. A tradition older than Christmas itself, hanging garland as fall changes to winter is an excellent way to give your home a festive feel. Many decorators start with just a simple evergreen garland and embellish it with trinkets and ornaments, but the basic evergreen garland is a tasteful addition to any stairway during the holidays. Evergreen complements hardwood floors and wooden staircases, and there are few holiday decorations quite so lovely as an evergreen garland wrapped around a hardwood staircase railing. You are not limited to using traditional evergreen garland. There is a lot of variety when it comes to garland of every color to suit your taste the and color scheme of your home. Beads, crystal snowflakes, illuminated garland strings with LEDs and holiday lights intertwined with garland are all excellent options. Your choices may depend on your budget, electrical outlet placement and the design of your home. Speaking of illumination, adding some festive lighting is another fantastic way to give your stairways and railings an added touch of class. From miniature lanterns designed to hold tea candles to LED crystal stars to hang from supporting rails or the railing itself, your options are virtually limitless. It is important to keep safety in mind, of course, when it comes to using actual flame lighting solutions, such as candles or oil lamps, on your stairways. However, adding these decorations can be a good option for specific events or holiday celebrations where you can make sure all flames used for illumination are kept secure and out of reach of children or pets. LED ropes and garlands with integrated lighting are obviously good choices for combination decorations, but you may want just a simple string of colored lights or lighting installations for your stairway. Soft yellow or white lights compliment hardwood and modern color palettes best, though there is no rule that blue, green, red and gold lights cannot be included in your festive display. Often, it is best to decide on a theme color when planning your staircase decorative installation and then using the lights to accent or complement the theme color. Like the star at the top of a Christmas tree or the shamash candle on a menorah, ornaments can give an overall sense of completeness by adding texture and fine detail to a holiday decorative display for your stairways. There is no end to the variety of material used to create holiday decorative ornaments, from plastic and glass to carved hardwoods and decorative brush. Some people like to adorn their staircases with ornamented wreaths instead of garland, oftentimes with built-in illumination to make them especially eye catching. Others may use tiny evergreen trees, snowflakes, snowmen or similar winter themed items and figurines. However you decide to integrate ornaments into your display, they can add that certain something that would otherwise leave your display feeling flat or less full. Materials should be consistent throughout the installation regardless of your choice in specific items. Otherwise, it can create too much of a contrast in texture within the display. For example, using lots of plastic and crystal in conjunction with hardwoods or brush wood might contrast too sharply to give the display a consistent theme and appearance. 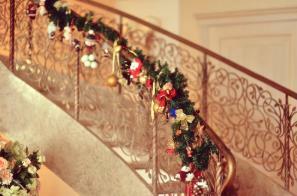 Ultimately, decorating your stairway is an excellent way to give your home some holiday spirit. Before you begin decorating, however, you may want to make sure that your flooring and railings will not detract from overall attractiveness of your holiday stairway display. Staircases and railings see some of the heaviest use of all the flooring surfaces in your house, so it may be wise to look into refinishing or replacing any worn pieces now while it is early in the holiday season. Freshly finished wood on stairs and railings adds beauty to your home that will last far beyond the festive time of year. Enjoy your winter holiday decorating, and best wishes for a prosperous new year!